Heat the oil in a large saucepan, add the onion and potato. Cover then cook over a low heat for 5 mins until the potatoes start to soften. Throw in the aubergine and mushrooms, then cook for a few more mins. Combine 1 tbs oil, kecap manis, Chinese cooking wine and ginger in a shallow dish. Add mushrooms and toss to combine. Marinate, stirring occasionally, for 30 minutes. Heat a wok over high heat until hot. Add 1 tsp oil. Stir-fry half the beef for 2 minutes or until evenly browned. Transfer to a plate Repeat using 1 tsp oil and remaining beef. Heat remaining 2 tsp oil in wok. Add onion and garlic. Stir-fry for 2 minutes. 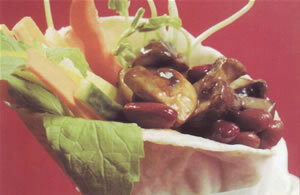 Using a slotted spoon, add mushrooms to wok, reserving marinade. 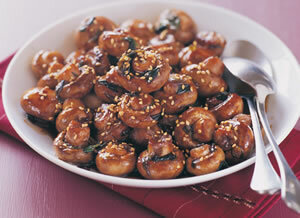 Stir-fry mushrooms for 1 minute. Add bok choy stems to wok. Stir-fry for 1 minute. Add beef, bok choy leaves and 1/3 cup reserved mushroom marinade to wok. Stir-fry for 1 minute until bok choy leaves just wilt. Serve with noodles or rice. Add mushrooms and green onions to pan. Cook, stirring often, for 3 minutes or until softening. Stir in stock and coconut cream. 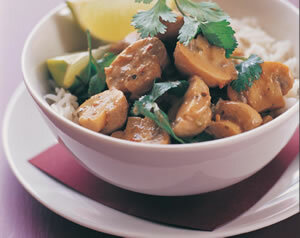 Simmer over medium-low heat for 5 minutes.Stir lime juice and brown sugar into mushroom mixture. Simmer, stirring occasionally, over low heat for 2 minutes. Stir through 1/2 cup coriander. Preheat a grill on medium-high heat. Place bacon on grill tray. Cook for 2-3 minutes on each side or until crispy. Drain on paper towel. Generously spray mushrooms with oil spray. Place stem-side down on grill tray. Grill for 2 minutes or until just softening. Turn and grill for a further 2 minutes or until tender. Transfer to a plate, cover with foil and keep warm. Heat a medium frying pan over medium heat. Lightly grease pan with oil spray. Fry eggs until yolk is almost set. Meanwhile, toast muffins until golden. Place spinach leaves on toasted muffin bases. 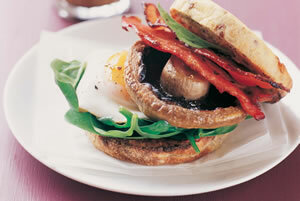 Top each with an egg, a grilled mushroom and bacon rashers. Season with salt and pepper. Top with muffin tops and serve immediately. Flatten chicken breasts until 1/2cm thick. Combine flour and salt and pepper on a large plate. Lightly coat chicken in flour. Heat 1 tbs oil in a large heavy-based frying pan over medium-high heat. Cook chicken, in batches, for 2 minutes on each side or until golden. Transfer to a plate. Add remain ing 1 tbs oil and leek to pan. Cook, stirring for 3 minutes. Add mushrooms. Cook, stirring often, for 4 minutes or until golden. Add wine to pan. Bring to to the boil. Gently boil for 2 minutes or until slightly reduced. Stir in stock, cream and lemon juice. Season with salt and pepper. Simmer over medium-low heat for 3 minutes. Return chicken to pan. Cover, cook for 4 minutes or until chicken is cooked through. Sprinkle with parsley. Serve with mashed potatoes. Heat oil in a large saucepan over medium-high heat. Add onion and garlic and cook for 3 minutes or until tender. 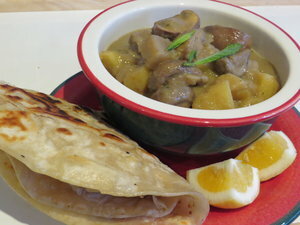 Add mushrooms to pan and cook, stirring often, over medium heat for 5 minutes or until tender. Add stock, potato and half the lentils to pan. Stir to combine. Cover and bring to the boil, stirring occasionally. Reduce heat to low and simmer, covered, for 20-25 minutes or until potato is tender. Puree soup until desired consistency. Season with salt and pepper. Stir through remaining lentils. Heat over low heat for 5 minutes. 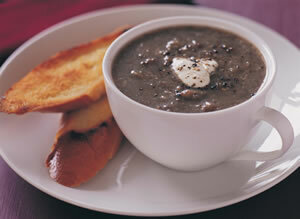 Ladle into serving bowls, top with a dollop of sour cream and serve with toasted baguette bread. Preheat oven to 180 deg C. Cook penne in a large saucepan of salted boiling water, following packet directions, until al dente. Meanwhile, heat 2 tbs oil in a large frying pan over high heat. 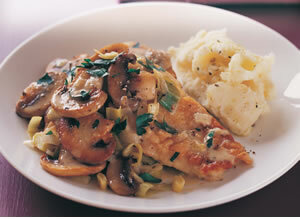 Add mushrooms and garlic and cook, stirring often, for 4-5 minutes or until mushrooms are golden . Set aside. Drain pasta and return to the saucepan. Add mushroom mixture, tomato pasta sauce, bocconcini and parsley. Season with salt and pepper. Stir well to combine. 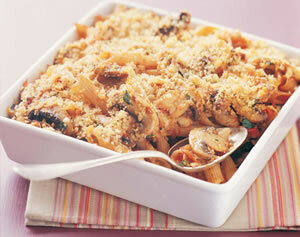 Spoon penne mixture into a 1 O-cup capacity deep baking dish. Combine breadcrumbs, parmesan and remaining 1 tsp oil in a bowl. Sprinkle over penne. Bake for 15-20 minutes or until hot and breadcrumbs are golden. Combine soy sauce, mirin and sugar in a large bowl. Whisk until sugar dissolves. Add mushrooms and toss well to coat mushrooms in soy mixture. Marinate at room temperature, stirring occasionally, for 45 minutes. Heat a wok over high heat until hot. Add oil and heat until hot. Add green onions and stir-fry for 30 seconds. 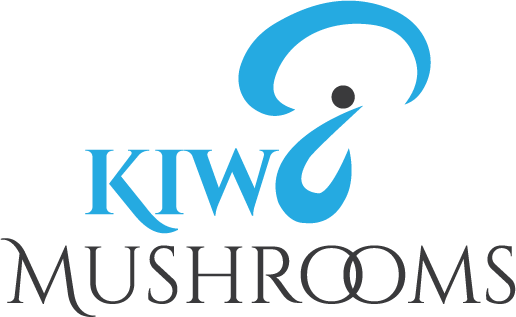 Using a slotted spoon, add mushrooms to wok, reserving marinade. 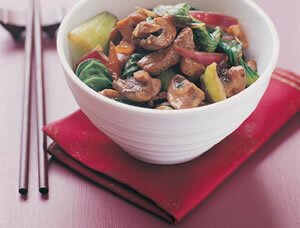 Stir-fry mushrooms for 3 minutes or until golden. Add 2 tbs reserved marinade to wok. Stir-fry for 30 seconds or until thick and syrupy. Sprinkle with sesame seeds. 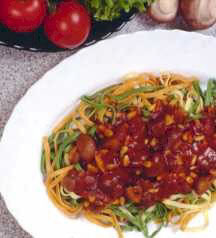 Serve with grilled beef steak or chicken and a green salad, if desired. Mirin is a Japanese cooking wine available from selected supermarkets and Asian grocers. Sweet sherry is a good substitute. Heat the oil in a fry pan and sauté the mushrooms. Warm wraps and top with vegetable sticks, mint and snow pea shoots. Place large spoonfuls of the mushroom mix in the centre of each wrap and fold the wrap around the mixture to make a parcel. Note: Garnish with a little sour cream before serving. Place the onion, garlic and oil into a medium microwave-safe bowl or rice cooker. Place into the microwave and cook, uncovered, for 2 minutes on high or until the onion is soft. Stir in the rice and mix well to coat the rice in the oil mixture. Add the stock and stir well to combine. Cover and cook in the microwave for 5 minutes on high. Reduce the heat to medium and cook for a further 5 minutes. 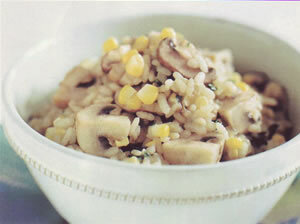 Working quickly, carefully remove the cover and stir in the corn and mushrooms. Cover and cook in the microwave for 5 minutes on medium. Leave to stand, covered, for 2-3 minutes. Stir through the parsley and season with salt and pepper. Serve immediately. Variation: Use 1-1/2 cups stock and 1/2 cup dry white wine. Replace the parsley with 1/3 cup grated Parmesan cheese. Thaw the spinach. Squeeze out the moisture. Heat a little oil in a saucepan, add the mushrooms and sauté. Break the feta into a bowl and add the spinach and mushrooms. Add the nutmeg and seasonings and mix to combine. Brush a sheet of filo with butter. 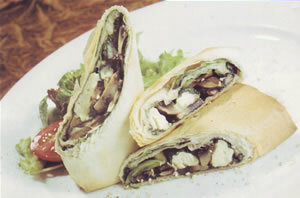 Place a portion of spinach mixture in the centre of the filo, about a third up from one end. Fold this end over the mixture, then fold in both the sides. Roll up to form a parcel. Continue with the process with the remaining mixture. Place the parcels on an oven tray and back for 15-20 minutes, until golden brown. If using fresh spinach, cut the stems off, place spinach in a large bowl and pour over boiling water. Leave to stand for 3 minutes. Drain and rinse in cold water. Drain again, gently squeeze out the excess water and pat dry with a paper towel. This sauce really is great with pasta, but also superb with fish, chicken, beef, rice or served with toast or crusty bread. It really is so versatile and tasty! Into a frypan put the mushrooms, oil and seasoning. Cook gently with the lid on until the mushrooms are tender and juicy - about ten minutes. There should be just enough juice to coat the bottom of the frypan. If you find there is too much, turn the heat up and remove the lid to reduce the liquid a little. Add the chives and pinenuts and remove from the frypan. Put the tomato juice, garlic, brown sugar and plenty of seasoning into the frypan and simmer until the juice has reduced and thickened. Add the prepared mushrooms to the sauce and mix. Spoon over your choice of prepared pasta for a delicious, easy to prepare treat! For the pastry, simply pulse the ingredients together in a food processor to form a dough, adding a little milk if needed. Wrap in cling film and chill for at least 30 minutes. Now make the filling. Start by trying the onion and mushrooms in oil until soft. Add the tomato puree and cook for 5 minutes, then add the soy sauce, peppercorns and stock. Bring to the boil, then reduce the heat slightly and cook until the liquid has reduced by half. Season to taste. Divide the filling mixture between four individual pie dishes. Divide the Stilton between the dishes too. Preheat the oven to 200 ° C. Cut the pastry into four pieces and roll into four circles, just bigger than the dishes. Damp the rim of the dishes with water and cover the pie dishes with pastry, trim the edges and cut a little hole in the top of each. Brush all over with egg wash to glaze. Bake the pies for about 20 minutes until crisp and golden. 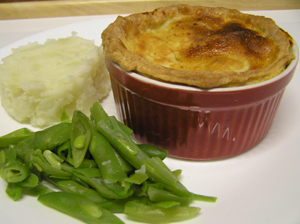 Serve with buttery mash and green beans if liked.